Some species of animals are incredibly unique and fantastic. Here are some of the peculiar species in the animal kingdom. How long can you hold your breath? I will give you $1 million if you can beat the Weddell Seal. This fantastic creature can hold its breath for 90 minutes. Megatherium was 750 times bigger than its modern cousin, the Three-toed Sloth. Opossums, like Hognosed Snakes, can play dead if there’s a threat. Opossum can stay in suspended animation longer than the Hognosed Snake. It can play dead up to six hours. Yellowbelly Sea Snakes have unique way to clean off parasites. They tie themselves in a knot. Animals with the nastiest technique of defending themselves against their enemies are the Fieldfare. They defecate all over their enemies. The Spitting Cobra spits venom to protect itself while the Horned Lizard squirts blood out of its eyes to scare away predators. Earthworms are truly and simply amazing. With their soft-looking appearance, they can dig 3.7 m or 12 ft underground. Who are the greatest builders in the animal kingdom? Well, Termites are known to builds mounds taller than a Giraffe which is roughly equivalent to two story building. They use only dirt, dung and saliva. A Sea Squirt undergoes stages of transformation. It starts as a tadpole-like creature, then as vegetable on the sea floor after losing its brain and limbs. Who’s the master of mimicry? This marine creature can change color, shape and skin texture in one second – it’s the Mimic Octopus. Some Beetle species have built in smoke alarm, well, Gannets, species of sea bird, have built-in airbags. 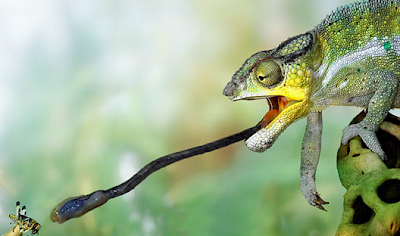 What animals possess the longest tongues? Some animals are gifted with long tongue like the Chameleon. Its long tongue can extend 11 feet long and can move at 13 mph.